The green and fertile island of Shapinsay lies a pleasant 25 minute crossing by ferry from Kirkwall. 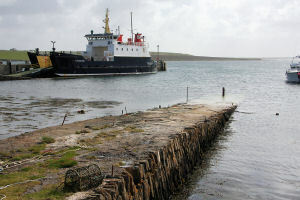 The MV Shapinsay, commissioned in 1989, operates a regular service throughout the day. The harbour is home to mock defensive walls built by David Balfour to complement the massive castle gatehouse, and it is also the site of the, now no longer used, public toilets designed to be flushed by the tide.